Relax, it’s not toilet humour…. or perhaps it is. Before I became a botanist I did sometimes use Public Conveniences and often they would be less nice than I would have liked. Quite often there would be graffiti on the walls, sometimes it would be quite explicit in it’s nature. 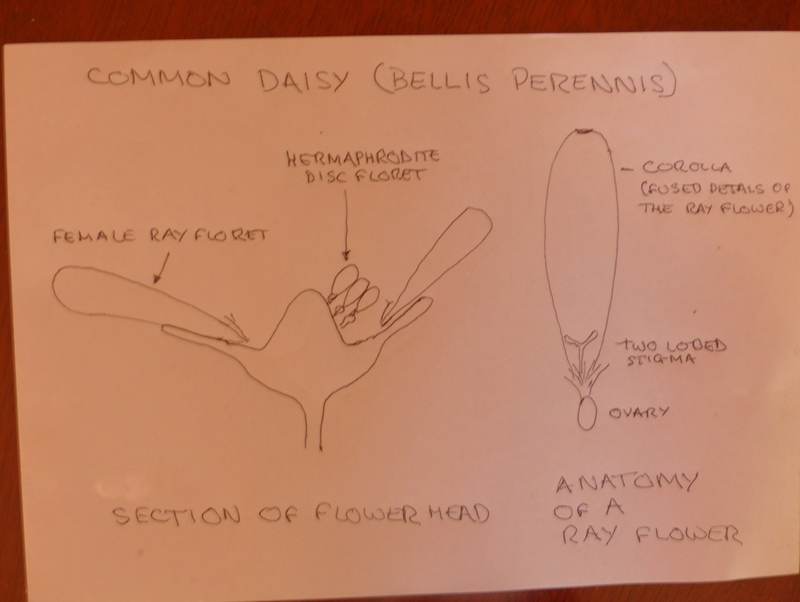 This morning I wrote a post about Bellis perennis (Pretty Forever) and I did some sketches to illustrate the composition and particularly the different male and female parts of the flower. Something about my pictures, maybe the colour, reminded me of toilet doors and I just thought…. Well if botanists peed, what would they draw on the walls? 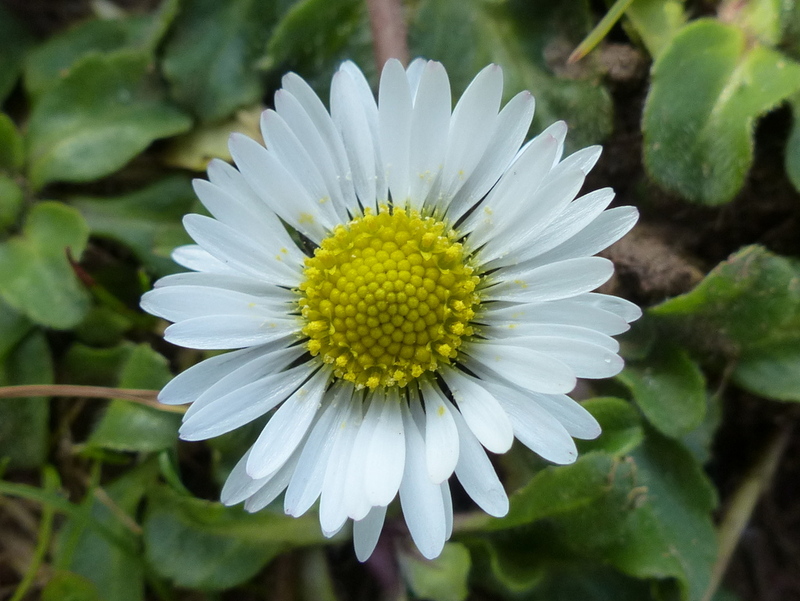 Bellis perennis, the name translates from the Latin, Bellus meaning Pretty and perennis meaning perennial or forever. 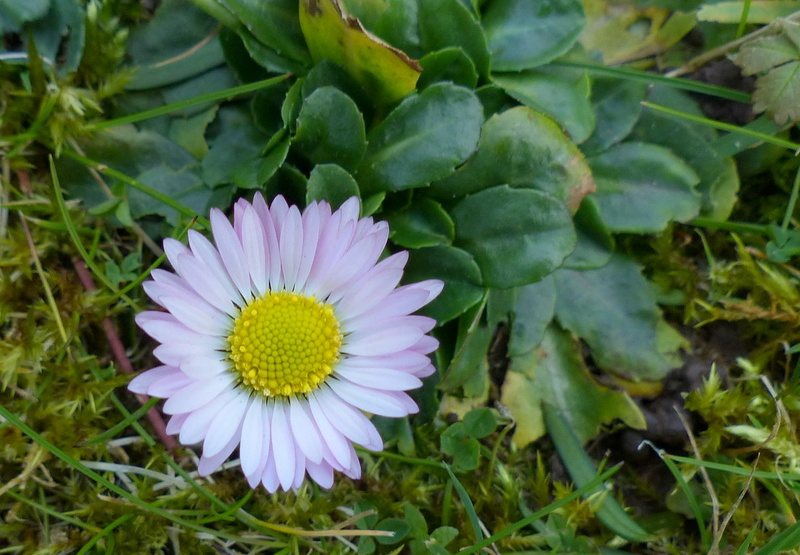 “Pretty Forever” you may know it as a Lawn Daisy. 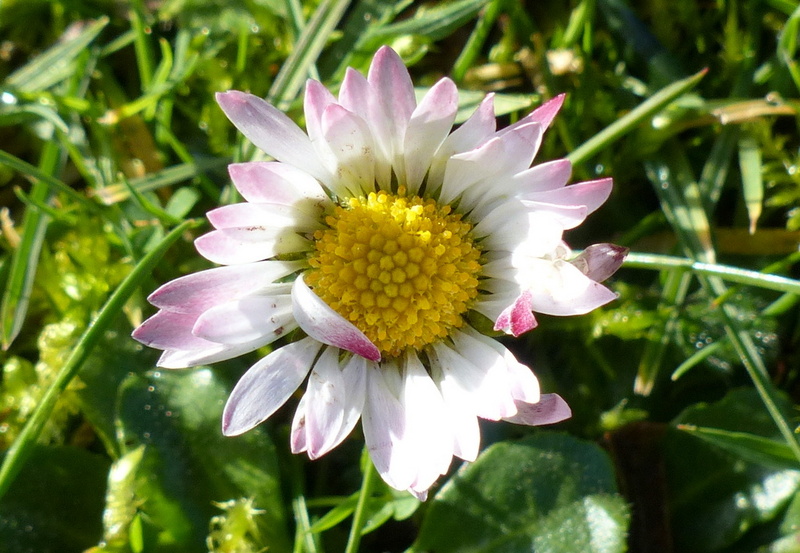 The common name Daisy is a corruption of “Day’s Eye” and is a reference to the way that the flower closes at night and opens in the Day. Native to the UK and Europe it is widely naturalised in most temperate climates including the Americas and Australia. 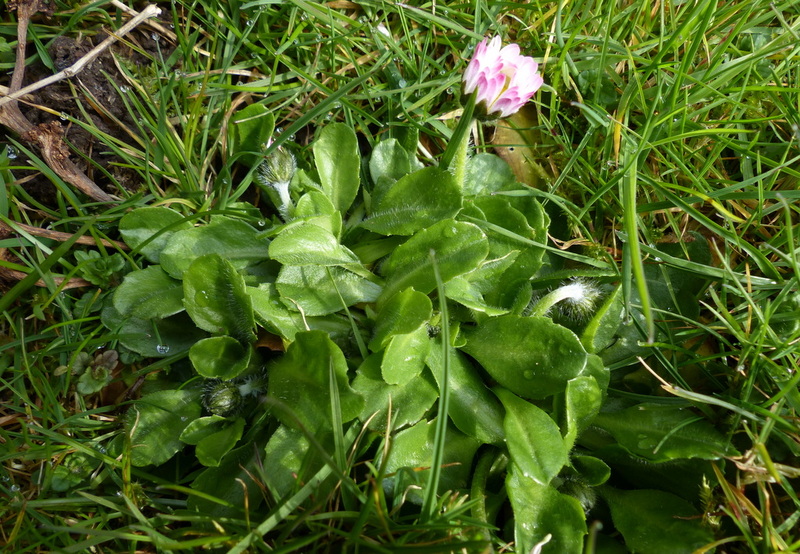 Flowering time is often given as from May to September but here in the UK it is one of those flowers that can be found at any time of the year when it is reasonably mild. I will put it down as February to November but do not be too surprised to see it outside of that season. There are many more flowers in the warm summer months. 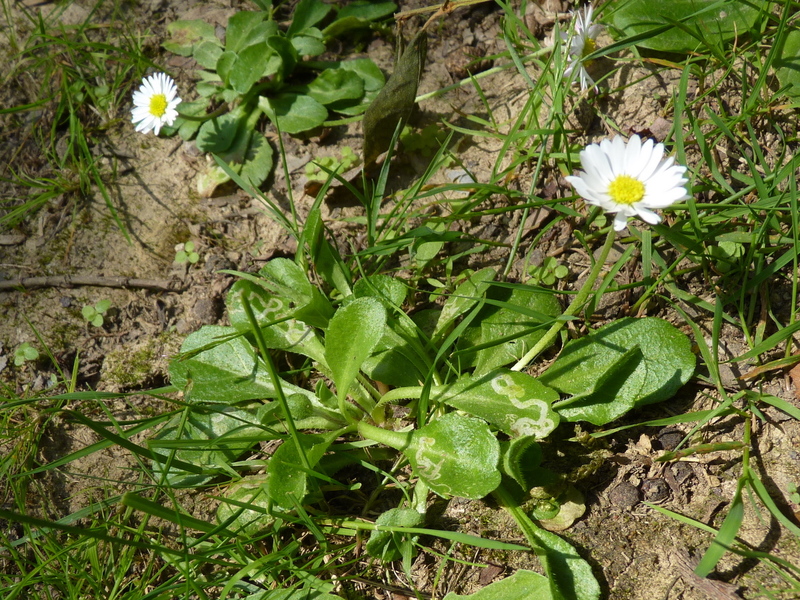 There are many flowers that look like Daisies so how do you recognise Bells perennis? 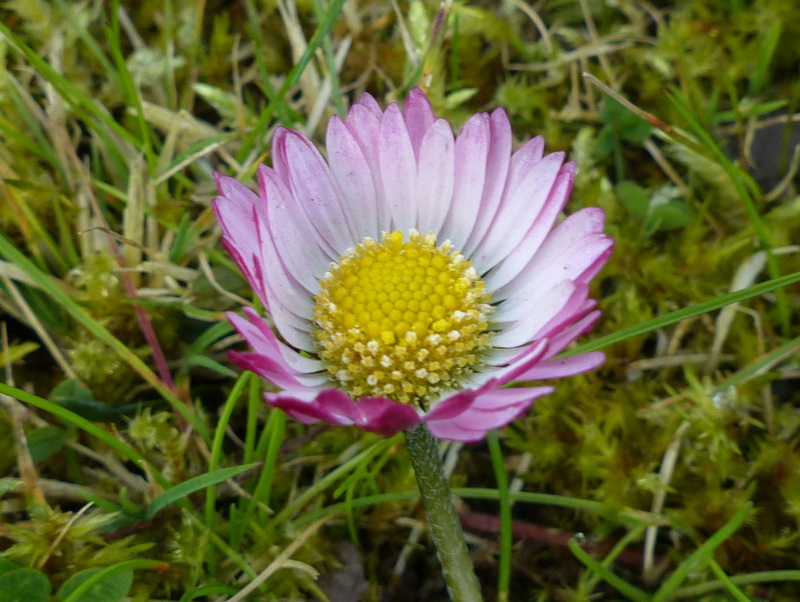 It is the only UK “Daisy” with a leafless flower stem. 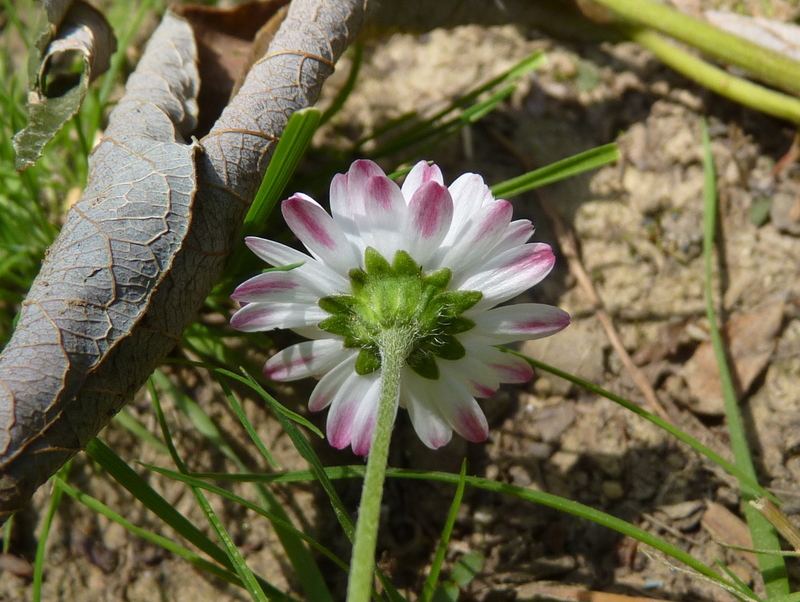 The leaves are all at the base of the flower. They are spoon shaped, sometimes round and they are slightly toothed. Behind the flower head are the bracts. These serve to enclose and protect the developing buds. Now we come to the difficult bit to explain. 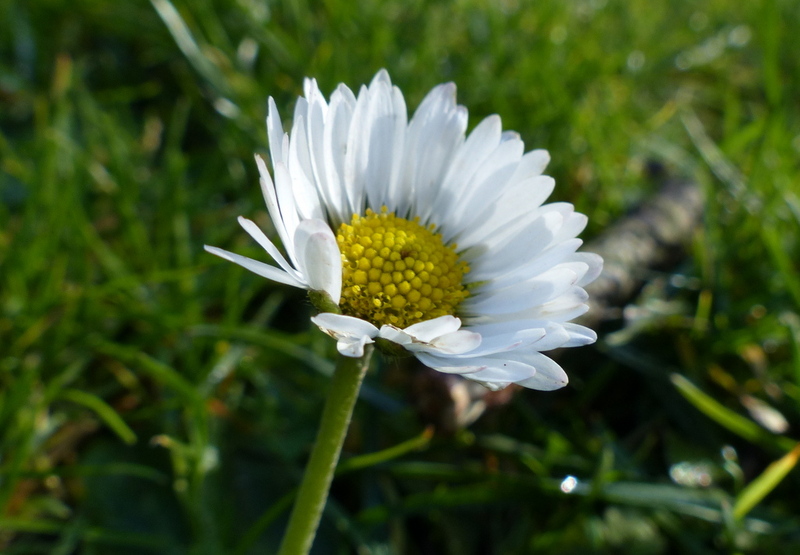 A Daisy is not a flower. It is a flower head or inflorescence made up of dozens of little flowers. Each of the yellow bobbles in the centre is a whole flower in itself and is called a disc floret. Each of the petals is also a flower in itself, a different kind of flower called a ray floret. Starting with the petals, how can a single petal be a flower? I have done a sketch to try to explain. Each petal is a whole flower, the petal itself is the corolla, a name we use when the petals of a flower are fused together. At the base of the corolla there is an ovary, where the seed will develop and coming out of the ovary are the stigma, the female parts that collect pollen. 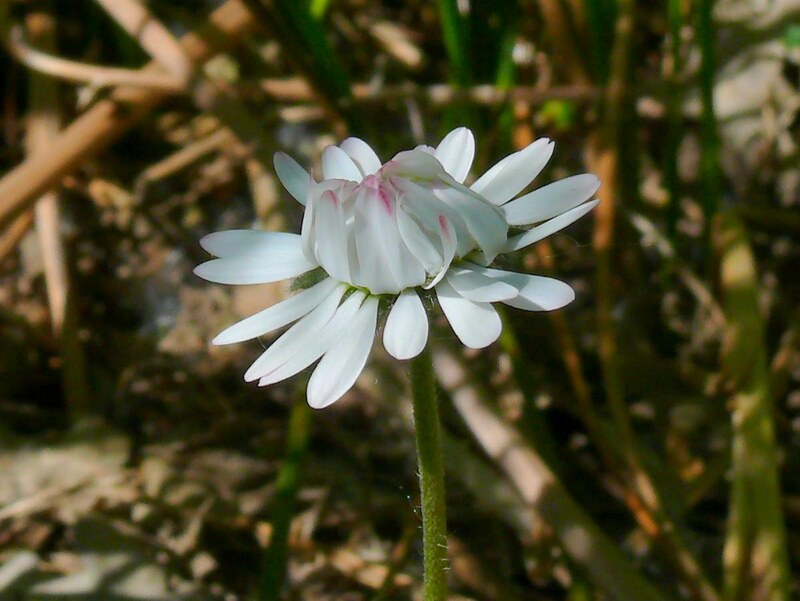 A Daisy’s ray floret is a female flower. The yellow disc florets in the centre are hermaphrodite, they have both male (anthers) and female (Stigma) parts. This time the corolla is fused into a tube that surrounds each little flower. The disc flowers open from the outside first and the youngest flowers are in the centre. Many of our common wildflowers are like this. They are members of the Asteraceae family, sometimes called the Composite family Sunflowers are composed in a similar way to a Daisy but other members of the family like Dandelions and Thistles are missing the disc florets and only have ray florets. 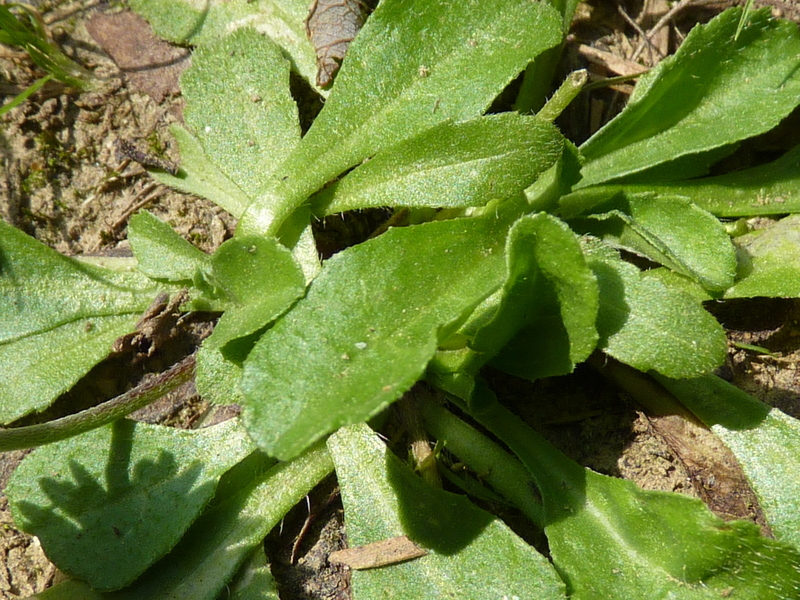 Common Groundsel only has disc florets. Is reproduction love or power? Too late to ask me, I am old and I don’t care 🙂 Take it up kids. 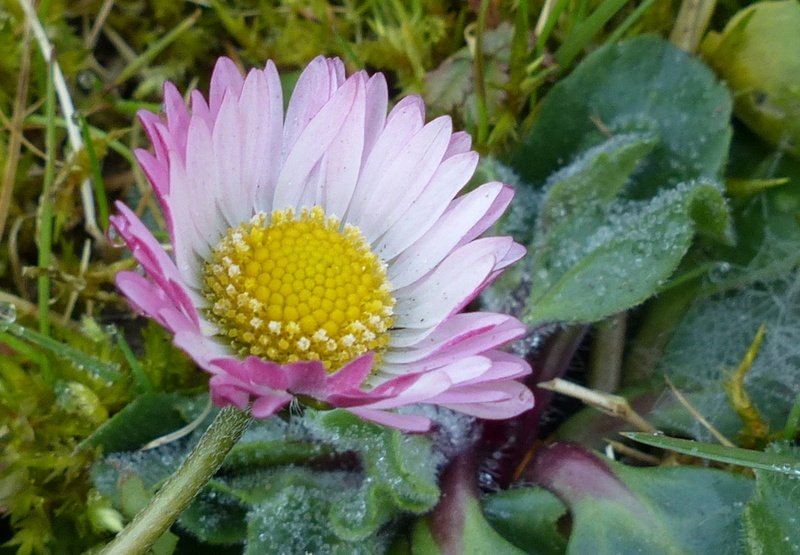 Never knew the humble daisy had so much going on. Very interesting. 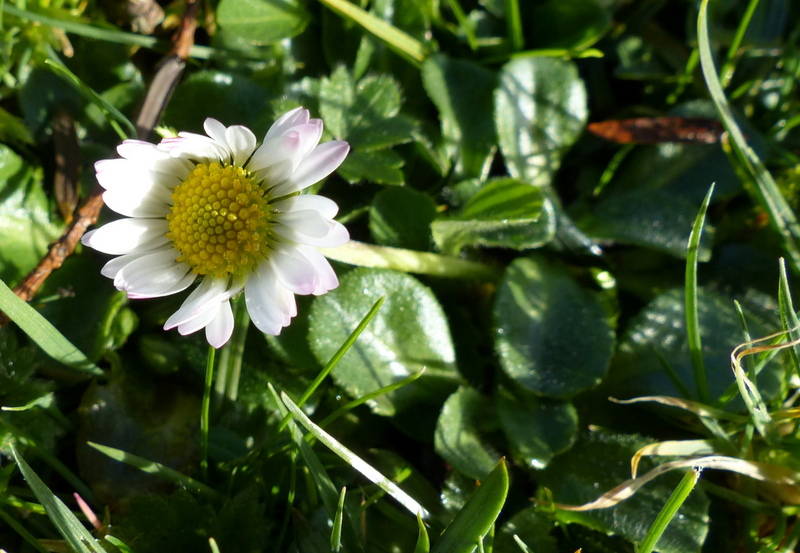 Thank you Maureen 🙂 Daisies seem to get everywhere that it is warm enough for them but I wonder how this one gets around so much. Pretty little daises. I haven’t seen the ones with pink here. So, what did you write on the wall? Thank you Sarasin 🙂 I can’t spell, I just draw pictures. I probably give the wrong impression about what colour Daisies really are because I am drawn to the pretty ones. There are a lot of white ones around here too. Thanks Jane 🙂 In terms of reproduction, so often it seems to be a fight to the death for my animals. The little Robins outside of my back door will kill for the right to reproduce and my Badgers were showing all the signs that they had been in a proper Badger on Badger fight when they appeared in the farm field, I think that they are ready to reproduce. It is very different for flowers, they all co-operate. I think that is why when the last people have gone from the planet the flowers will turn to each other and say, “You know, I thought they were never going to go?” then they will just get on with turning the planet green again. Very well done botany lesson! 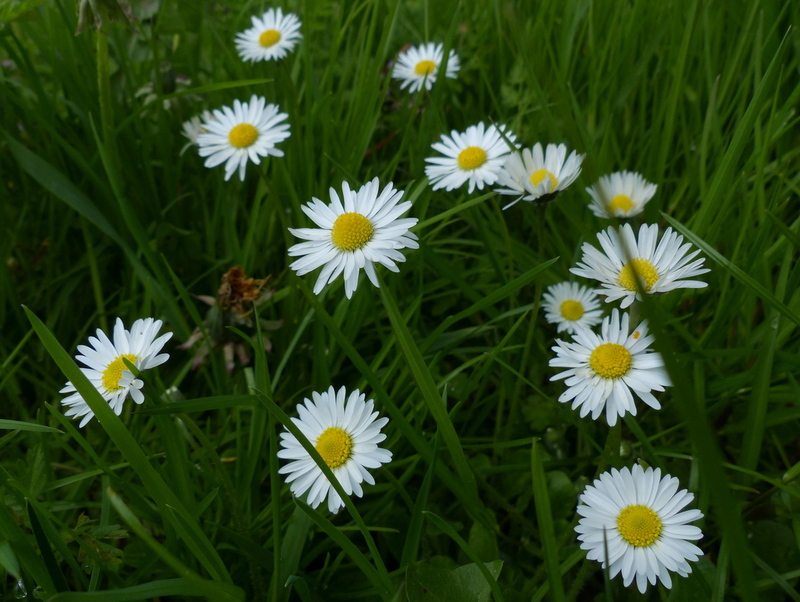 These daisies are not as common here in the NE US as they are in the UK. One must buy them in nurseries and then if they don’t self-sow, die out. Perhaps here in zone 5, they are not as happy. I always find them to be so cheerful. Thanks Eliza 🙂 Over here they are supposed to be hardy to UK zone 4, so maybe they are on the edge of their comfort zone in Massachusetts. It seems so, our winters can be pretty harsh in Jan. Sometimes the frost goes down several feet. Thank you Tamara 🙂 I would have liked to do those illustrations with photographs but they are very, very small bits. I’m old, too, Colin, which is why I think reproduction is powerful love. You should have adopted the pen name W C Fields. Multiple flowers eh? Well, I guess that’s inflation for you. Thank you Andrew 🙂 W C Fields? Very good. Good info. Now I have a new rabbit trail to explore. Flowers that aren’t flowers. Thank you Dennis 🙂 There are a lot of them about. They are flowers but just not one flower. They are an inflorescence disguised as a flower. Great post as always, Colin. 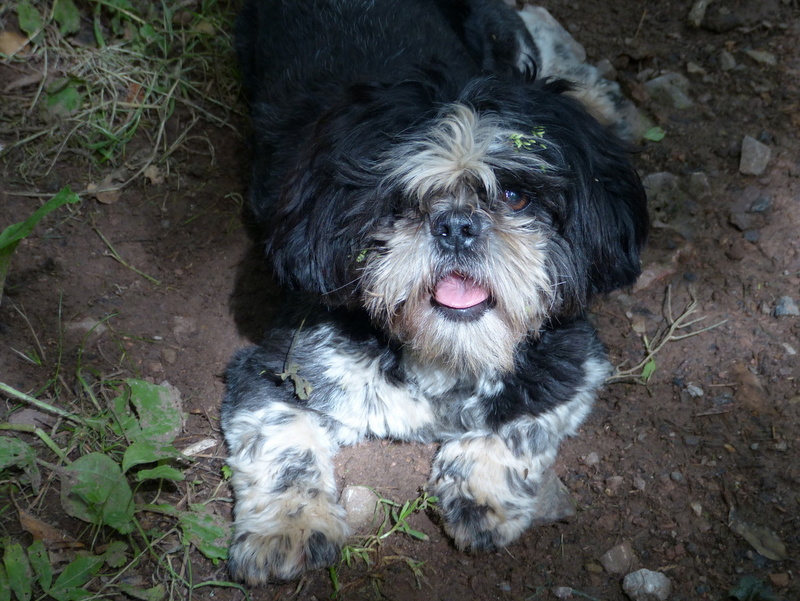 LOVE the sunshine and shadows photo of Fizz yawning at the top. This was educational, and your drawings helped a bunch. Thank you. And my vote: power. Another fascinating post. 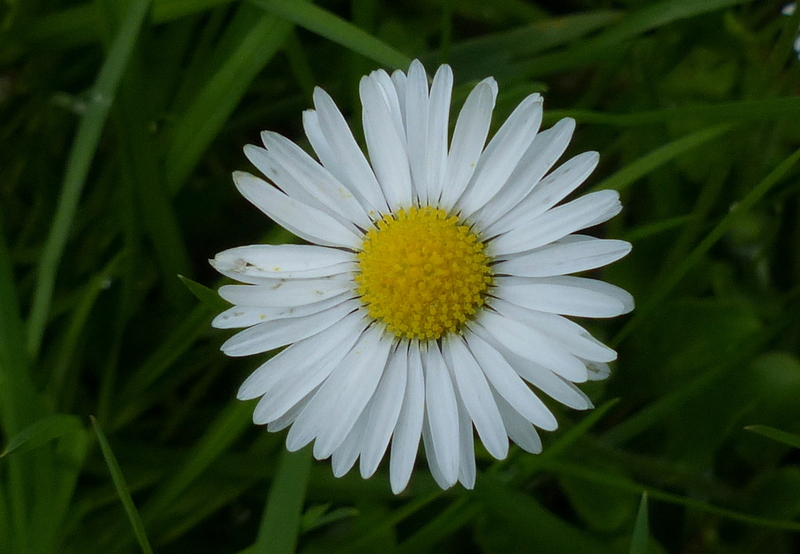 Daisies are both lovely and awkward at the same time. All those little flowers look great in their own way, but the leaves and roots are quite resistant to being plucked from lawns. Thank you Stephen 🙂 Yes, I guess that is why they call it a Lawn Daisy. Thanks Colin. 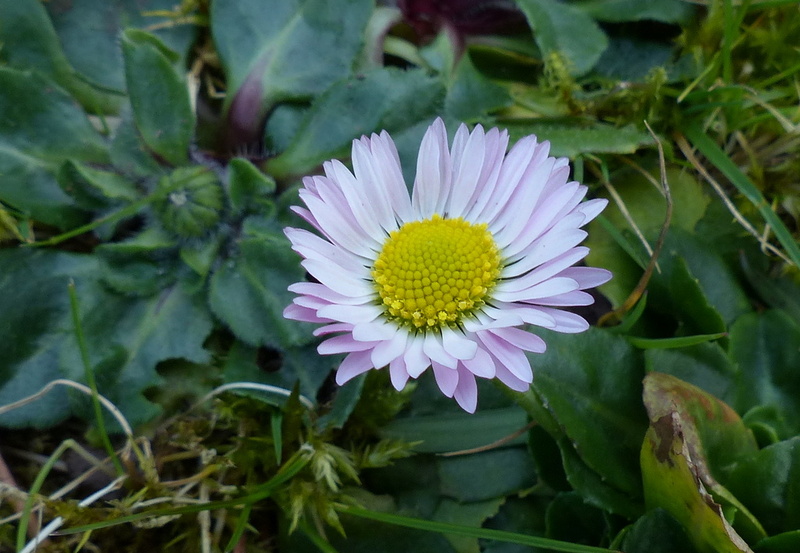 I am interested to know how the daisy reproduces. Does it need pollinators to visit, or is it self-pollinating as it has both male and female parts? Thank you Emily 🙂 Good question and the answer is both. The flower is self fertile but it also produces nectar and pollen. It is the preferred nectar source for the Small Copper butterfly but also a good source of nectar for Honey Bees. Intriguing. Makes me wonder why the flower bothers attracting pollinators, since it will be giving away sugar for nothing. Perhaps the butterflies and bees raise its success rate, or else it has not evolved out of producing pollen and nectar. I am going to guess that it just makes for a healthier species if they can cross pollinate rather than inbreed and that self fertilisation is just the back up plan. It is not at all uncommon for plants to be self fertile and there seem to be far more hermaphrodite flowers than plants with separate male and female flowers. 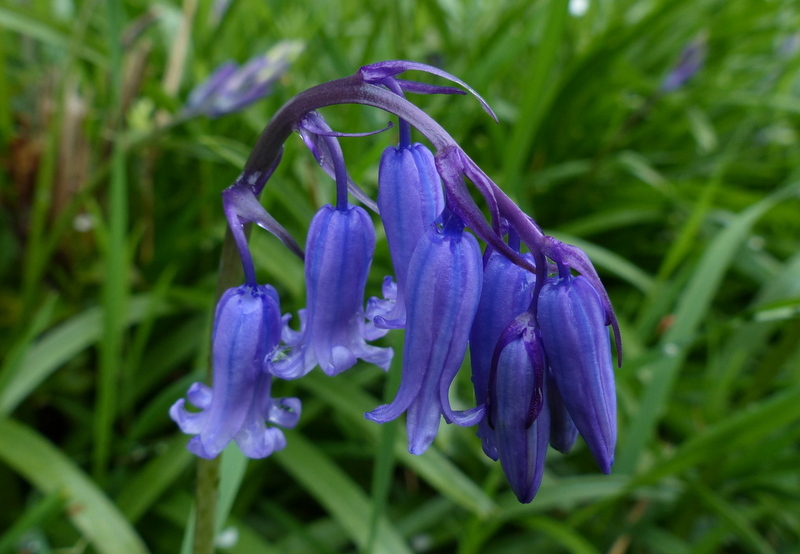 Most bulbs seem to have the ability to produce little bulbs as wall as seed from pollination. Flowers have given a lot more thought to the business of reproduction than animals. 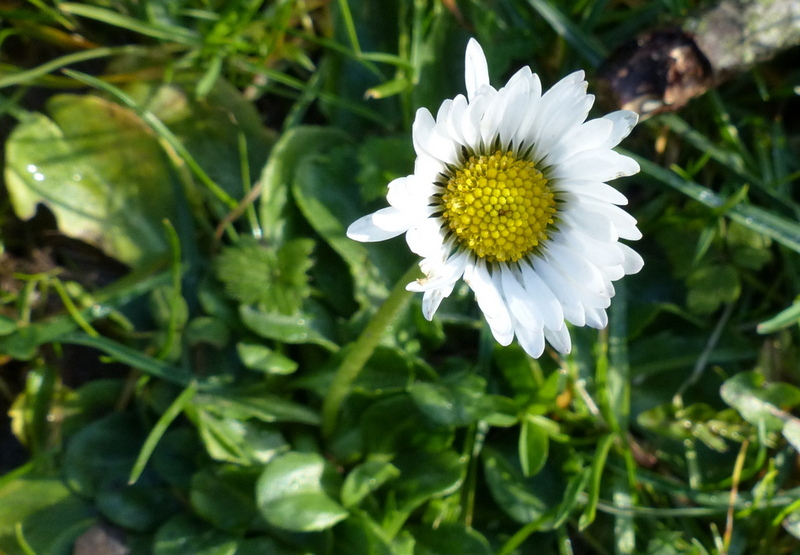 Now please don’t say a daisy isn’t a flower. Thank you Ibeth 🙂 A Daisy is just more than a flower. 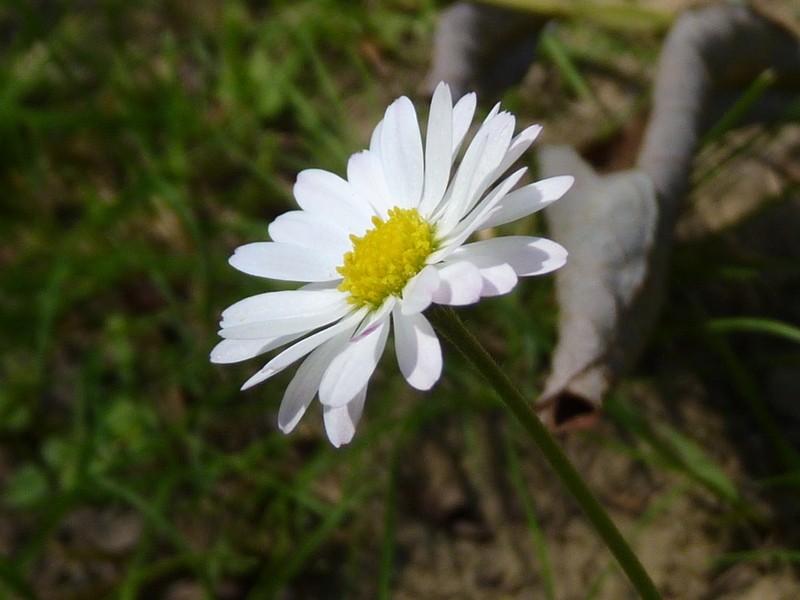 A simple daisy isn’t so simple after all. My aunt has no daisies on her lawn and for about 20 years has been trying to introduce them and has failed miserably. 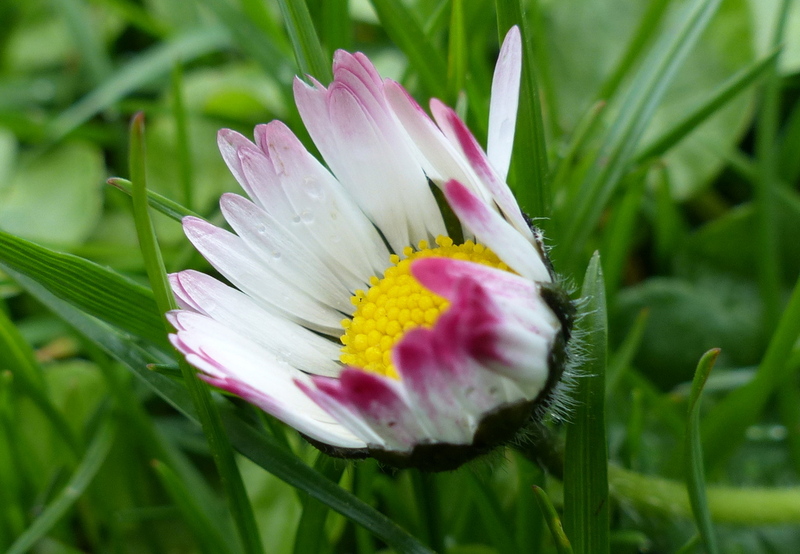 She lives in Kent and believes that a lawn isn’t a proper lawn until it has daisies. Thanks Clare 🙂 I absolutely agree with your Aunt. For some reason I was under the impression that ray flowers were sterile. 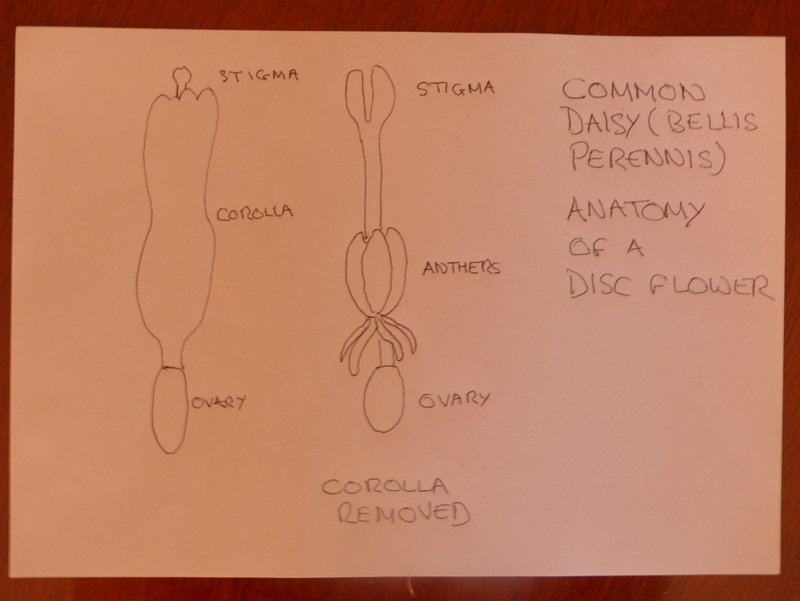 I think botanists should draw pictures of plant sexual organs on bathroom walls, or possibly something like “Disc flowers are hermaphrodites!”. Thank you Jason 🙂 That is an interesting point about sterile ray florets but why would that happen? The flowers that I have looked at differ. 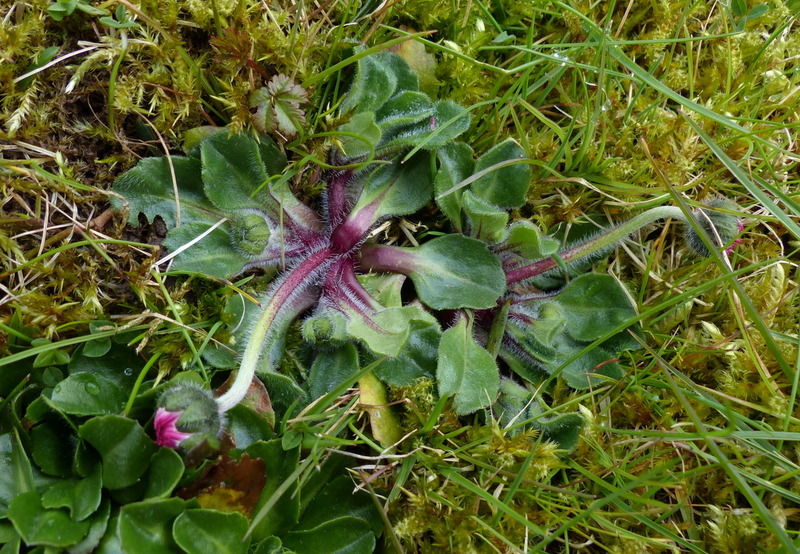 I am writing about the Colt’s-foot next and wanting to know more about that species I went looking. The first information that I turned up was that the disc florets are sterile. Well I can see their anthers. The disc florets are male? Isn’t that where the seeds come from? I can see that the ray florets might be male and that it would be misleading to call them sterile. 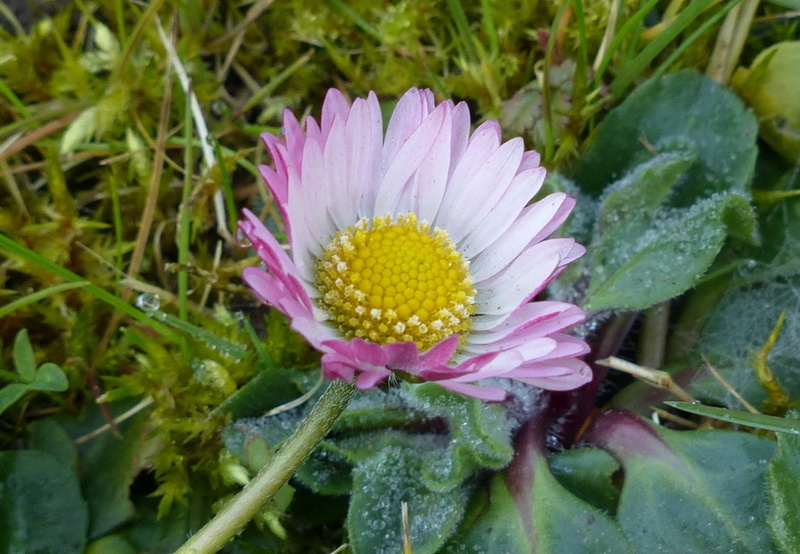 In the picture above of Coltsfoot the disc florets are male. They contain stamens with pollen producing anthers. Insects collect the pollen and transfer it to the ray florets. The ray florets are female. They contain a pistil. A pistil is made up of a style with a stigma at the top of it. The stigma collects the pollen from the insects. At the base of the style is the ovary and this is where the seed will develop. I will never look at bathroom graffiti the same way again 🙂 I’ve tried to grow English daisies as my grandmother always had them, but alas the walnut tree killed them. 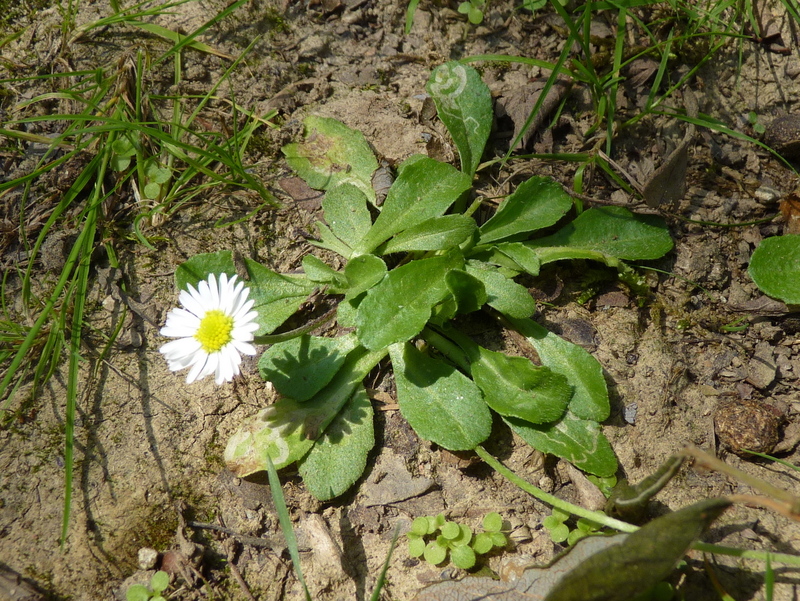 Lawn daisies “Leucanthemum vulgare” thrive in my lawn, but not when transplanted to my garden, go figure. They are now considered invasive here, but I usually let my back lawn go to meadow in the summer anyway and let them have their way. I vote for power. Life is aggressive (understatement) and wants to prevail at all costs. Extremophiles teach us this. Where there is lifewill, there is a way. Colin, your blog is Flower Power! Thank you Stephanie 🙂 We need more daisies, childhood would not be the same without them. I wanted to do an illustrated guide on how to make daisy chains to accompany this post but just didn’t have enough flowers. 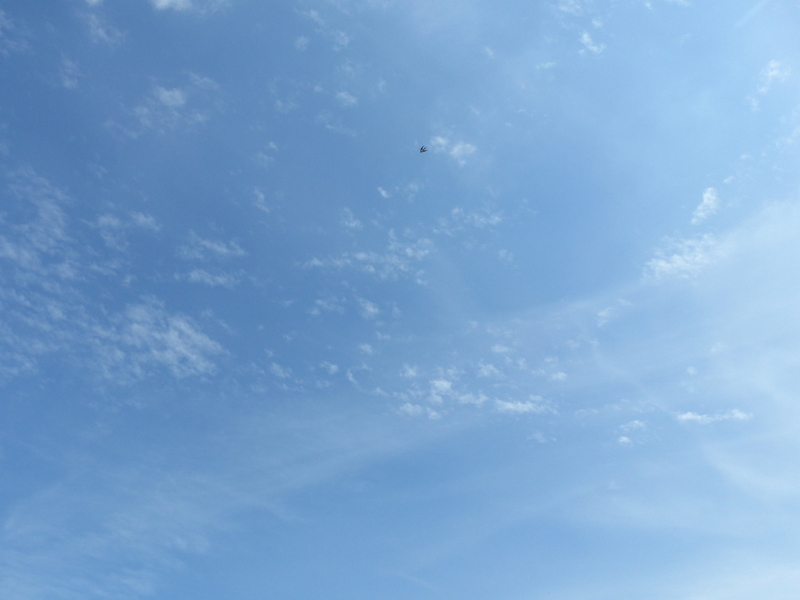 Maybe in the summer. I love learning on your blog. Thank you Lora 🙂 Me too. So then if I understand this correctly, every daisy I look at is actually an entire colony of flowers carefully constructed to give the appearance of a single entity. Those little critters are smarter than I gave them credit for, sneaking their forces into our cities unawares like that. I certainly hope they have no hostile intention. Lol. Have a great New Year’s sir.